No Bubbles To Eat | Mediterra - Swim & Run Better Than Ever! Recently we conducted a TI Coach training camp in Poznan Poland at the amazing Termy Maltanskie olympic pool and aqua park complex. (It will be the site of the 2014 European Championships, I believe). On the last day while doing some sync swimming and video in the 25m wide 5m deep diving pool I noticed the stainless steel vents crossing the floor of the pool, with bubble holes. I raised the question of why bubbles are pumped into a pool during platform diving competition. One of our trainees, a university sports ed graduate, explained that the bubbles help lower the surface pressure of the water to soften the impact of the diver in case of an off-vertical entry. This was new insight for me about diving, but it corresponded to what I already understood about hydrodynamics and the effect of bubbles on a swimmer. Bubbles are evidence of turbulence. Bubbles mean there are voids in the water, which means there are low-pressure zones in that volume. Essentially, bubbles mean ‘low-traction’ zones. For a high diver this is good news. For a swimmer this is bad news. 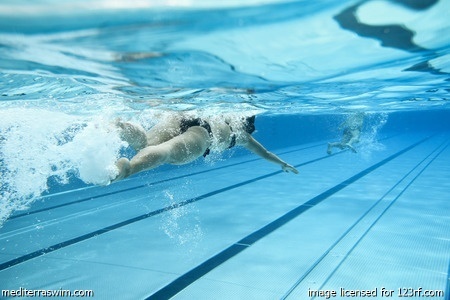 A swimmer creating bubbles with each kick or stroke is the equivalent of a car spinning its wheels in the mud or snow. Bubbles mean there is less firm water to press against. In order to overcome the loss of traction when pulling air down with each kick and arm entry the swimmer has to exert even more effort to make up for it. Bubbles are the product of in-accurate movement patterns and lead to considerable unnecessary waste of energy. Erroneous thinking has crept in and built a loyal following the culture of swimming for a long time. It is commonly believed that the sound of waves and splash and slapping of feet and hands on water was a sign of good hard work and improving swimmers. It may be hard work, but not necessarily good work. In fact that noise, that splash, those waves, those bubbles are all evidence of wasted energy – inefficiencies being perfected over thousands of meters. A pool full of hydrodynamically astute swimmers, even at peak effort level, would be shockingly quiet and calm. It is impossible to remove turbulence completely, and as velocity increases so will unavoidable turbulence. (Humans have too many un-fish-like moving parts!) However, a massive proportion of the turbulence a common swimmer makes is quite unnecessary if only she trains carefully to reduce it. It does not require a down-grade in her effort, just an upgrade in her accuracy of movement. It is essential for the aspiring swimmer to make turbulence-removal, drag-removal, bubble-removal a top priority, even over power production. Why produce more power, more waste when you can get the job done with less? You can still swim fast, but do it quietly. In fact, the quietest swimmers will be the few who pass the rest and reach the very top of their event. Eat My Bubbles: It’s a clever (and popular) boast among swimmers, but scientifically-speaking it is not something to brag about. If you can see enough of my bubbles to eat them then that means I am wasting a lot of energy in front of you. Actually, that may be a good sign to you that your quiet, efficient stroke will over take me soon. I was paid a nice compliment last fall in the sea as we were practicing drafting and pace-lining in a group swim. One swimmer came up after a set and said he liked the experience but had a hard time swimming behind me because he couldn’t find my bubbles to follow. Indeed, I make very, very few. Not only is it a sign of low turbulence, it is also a great way to stay ‘hidden’ in a racing pack of swimmers. It’s actually quit a simple idea. While you swim spend a great deal of time concentrating on: no splash, no waves, no noise, no bubbles. Even at top effort levels. Don’t worry, you may not be good at it yet because you haven’t practiced it (you have to start at slow speeds and work your way up). It’s simply a new skill to learn. But you’ll soon discover the effortless speed that comes from obsessive drag/wave/bubble removal. And then no one following you – and falling behind you – will be able to find any of your bubbles to eat. © 2013 – 2016, Mediterra International, LLC. All rights reserved. Unauthorized use and/or duplication of this material without express and written permission from this site’s author and/or owner is strictly prohibited. Excerpts and links may be used, provided that full and clear credit is given to Mediterra International, LLC and Mediterraswim.com with appropriate and specific direction to the original content. Hi Mat, there are some bubbles when I begin my stroke into the water…are you writing that there should be none.?? ?..I have only been doing the TI method for two months and I am a competitive swimmer which messes me up…when i have to go fast. Bubbles are evidence of turbulence, or in the case of the arm entry, a less-than-clean entry. But focusing merely on removing bubbles may be misleading, because certainly you could reduce bubbles in a way that reduces your stroke effectiveness. Bubbles are just one form feedback, among a few, that you can use to measure technique- but alone they do not tell the whole story. The bubbles will go away as one of the natural effects of your improving technique. Also, if you notice more bubbles coming down with one arm than the other, this tells you something is different with that arm. It draws your attention to look for the irregularity. Again, bubbles are just evidence of a problem that needs solving, so look for the problem that needs solving, not merely the removal of bubbles. And when you go faster, at some point you trip the circuit breaker in your brain (automated motor control) and return to default mode technique – putting too much load on an underdeveloped motor-control pathway. It takes time to replace the old with a new default that can handle higher pressure – you have to start slowly with the new patterns and gradually build up while at the same time allowing the OLD patterns to atrophy by disuse and lose their default status in your brain. After a while, from complete refusal to use old patterns of swimming, you’re brain will only know the new patterns and regard them as the default. Here’s an analogy I have in my head about this: It’s like you’ve been building climbing up an 8 foot ladder and reached some peak with your old technique. The new technique promises you a 12 foot ladder, but you have to climb down from your old ladder and begin climbing the new one, learning each rung to get you to the 12 foot potential. The dilemma is that you can’t have both. That will take time and commitment to imprint the new patterns and neglect the old ones – your progress will be proportional to how much you completely you neglect the old patterns and practice the new patterns with your best concentration. As you can see, this would take a great deal of courage (or desperation) on the part of an accomplished swimmer to back off the old ladder that was giving them some results to totally rebuild their engine and control panel from scratch in faith that they can get onto a better one. It seems to safer to many to just dabble with TI and tinker with the technique they have in place rather than totally overhaul it. I believe this is one of the reasons why experienced swimmers have a harder time with TI than those without some accomplishment in their past. I can sympathize with this. At first, it does take faith to invest in TI, but I think for all of us who have, we are VERY glad we did. I’ve tasted both and I wouldn’t go back to the old ways.